Food Intolerance discovery: Part 1 | RTB's Blog on Health & Fitness, Travel, Automotive, DIY, Dating & Relationships, Childcare & Education and much more! My fiance has suffered from skin problems for many years, and the primary cause appeared to be down to what she ate. The only problem was determining exactly what it was that was causing the problems. Food intolerances – as opposed to food allergies – can take several days to show, and the symptoms are often cumulative. We’d tried restricting certain foods for several days to try and find the culprit, but often had conflicting results. It seemed that it may be down to a combination of foods, and other conditions, such as sleep (a lack of good sleep seriously affects her skin), humidity and use of skin moisturiser. She’d seen many dermatologists through the years, but no one seemed to have the answer. In the end we decided to give one of the online food intolerance tests a try; we chose the Cambridge Nutritional Sciences blood test. There’s lots of debate on how accurate these actually are, but we thought it was worth giving it a shot. We went for the Food IgG Antibody Testing; this detects levels of antibodies in your blood to indicate which foods you may be intolerant to. I figured that whilst we were at it, I’d try the test too. I don’t have any major skin problems; just a little dry skin on my hands and occasionally on my cheeks. I do often have a very red nose and cheeks though; I’d previously noticed that seafood could trigger my redness. I’m often pretty bloated too – for years I’d eaten healthily and worked out and have always joked that I have ‘abs of steel’ but that they are buried under a layer of flab! Truth be told, there’s not so much fat there, but my stomach is rarely flat – it’s very often bloated. Could a food intolerance be causing that? In short, yes, it could. But the tests aren’t cheap, so I opted for a the basic test that indicates whether or not you have any intolerances at all, but doesn’t actually tell you which (although suggests which food groups may be affected) – you can then opt to upgrade and do a more comprehensive test. There are a number of options available, based on food groups. For example, they do tests specifically for vegetarians and vegans. The blood sample kit arrived. You have to prick your finger with a little device and then squeeze the blood into a tube. It is not easy. For a start, one drop of blood is a tiny amount – they need a lot more than that. After some trial and error, we found the best technique was to put our arm down (to help blood flow) and the other person squeeze the others finger, and scrape the drops into the tube. It took about 20 minutes to fill the tube sufficiently. We then sent the samples back and waited. My test flagged up that I had potential intolerances. My fiance had gone for the full test covering everything – and we were somewhat horrified by the results. She was intolerant to everything. Ok, that’s an exaggeration. But the list of intolerances was far more than we’d expected. Intolerances are listed on a numeric scale; those less than 23 are not considered an issue. Between 23 and less than 30 they are listed as ‘borderline’; 30 and above are problematic and classed as ‘avoid’. Having an intolerance to soya and beans in general was a problem for my fiance, who’s a vegetarian. Rice and potatoes were flagged on her borderline intolerance list. I decided to upgrade my test and find out my specific intolerances. My reading for cows milk was off the scale – 160+. I drink so much milk! Every day I have one or two large lattes, I often drink milk on it’s own, or with a protein shake – the protein whey itself having originated from cows milk! Another surprise was that both egg whites (121) and egg yolks (41) came up ‘red’ – I’d usually eat 2 or 3 omelettes a week, made with 3 eggs each. Oh, and with cheese added – made from cow’s milk, of course! It also showed I was intolerant to peas, beans (red kidney beans and white haricot beans), barley and wheat. 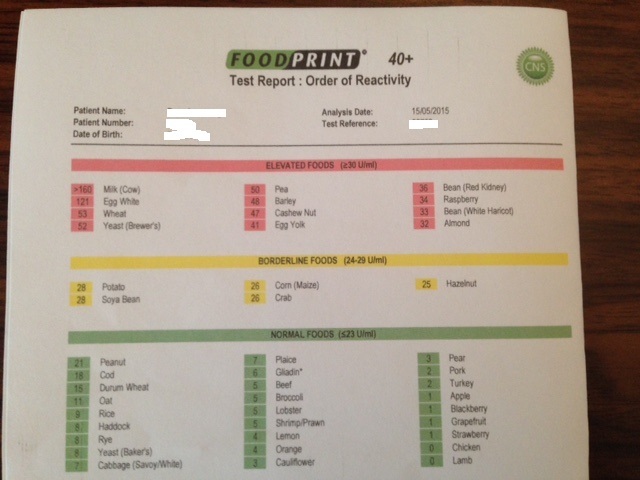 Cashew nuts and almonds were also flagged as ‘red’. The only fruit shown was raspberry – yet oddly, strawberry, the fruit most people have an intolerance or allergy too, showed as being fine – this only scored a 1. What I also found odd was that wheat was flagged as a high intolerance with a value of 53, yet gluten, oat, rye, durum wheat and bakers yeast were shown as green. Brewers yeast was a different story though – in the red at 52. 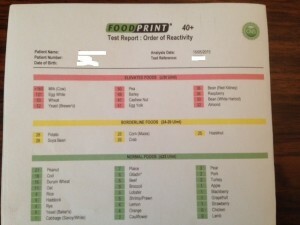 On the borderline results (yellow) were potato, corn, hazlenut, crab (prawn and lobster were ok and in the green) and soya bean. So what did this mean? Well, I wasn’t going to die if I ate these foods – I’d been eating them all my life. But by avoiding them, perhaps I’d be less bloated. Perhaps my nose and cheeks would be less red. Apparently, by avoiding the foods flagged for 3 to 6 months, you can ‘reset’ your system and potentially remove that intolerance. Even if the ‘reset’ didn’t work, I was interested to see what the results would be by avoiding those foods.